Q- If Jesus’s native tongue was Aramaic, wouldn’t it be more accurate if the Gospels had been written down in Aramaic instead of Greek? Was any subtle meanings lost by not having his parables and teachings in Aramaic? A- The impression is sometimes given that the true authority is located in the words of Jesus in original Aramaic form, rather than in Greek words recorded by Matthew. Matthew’s record is of the nature of interpretation and is necessary. His words should be set aside carefully, so that we have uncorrupted words of Jesus. We must trust that Matthew’s interpretation is accurate and the Holy Spirit was with him when he translated it. Q for Mr. Webster- John said that he was very selective in what he choice to include in his writings. Why wouldn’t John include all of Jesus’s miracles so that we could learn more about Jesus? Question: Does the fact that Jesus didn’t write anything in the Bible weaken the trustworthiness? In other words, would the Bible be more reliable if Jesus had some role in the writing of scripture? Answer: Imagine if four people wrote a biography on your life: your son, your father, a co-worker, and a good friend. They would each focus on different aspects of your life and write from a unique perspective. One would be writing about you as a parent, another as a child growing up, one as a professional, and one as a peer. Each may include different stories or see the same event from a different angle, but their differences would not mean they are in error. When we put all four accounts together, we would get a richer picture of your life and character. That is what is taking place in the Gospels. Question: Why didn’t Jesus contribute to writing one (or more) books in the Bible? Q: Why wasn’t the NT written in Aramaic since they were first told in it. A: “Ancient Hebrew was the tongue of the ancient Israelites and the language in which most of the Old Testament was penned. And some have compared the relationship between Hebrew and Aramaic to that between modern Spanish and Portuguese: they’re distinct languages, but sufficiently closely related that a reader of one can understand much of the other. Aramaic was very popular in the ancient world and was commonly spoken in Jesus’ time. Q: Why in the gospels are Jesus’s saying given without context? Question: How is each of the four gospels different from one another? Answer: Each of the Gospels was written for a different audience and focuses on a different element of the Good News of the miraculous birth, life ministry, and sacrificial death of Jesus. For example, Matthew’s account of his experiences and observations is directed primarily to a Hebrew audience. Mark’s account is focused on a Greek Gentile audience. Luke’s text is made up of accounts of the experiences and observations of others. He primarily writes to non-Jews to clarify and organize the Good News. Like Matthew and Mark’s accounts, John writes a first-hand account whose purpose is to prepare believers for evangelism of the Good News. 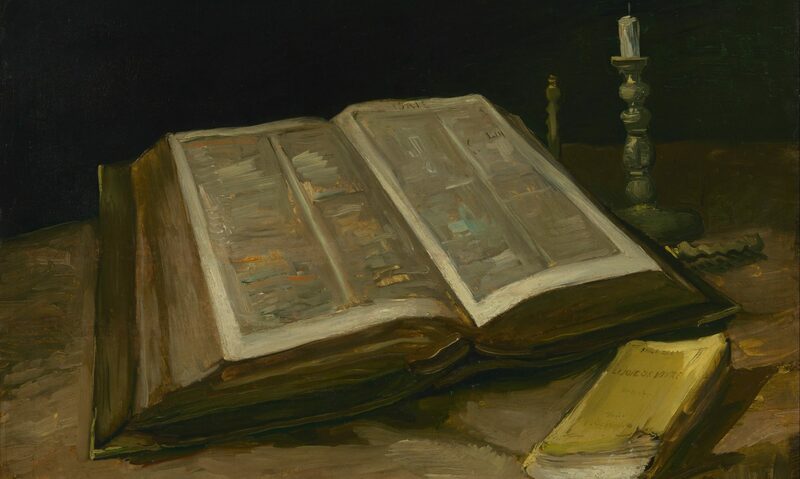 Question: Despite differing content in the gospels, there are many similarities and strong evidence to support that the gospels were not written independently of one another. It says in the book that many sayings appear nearly word for word in different gospels, leading one to conclude they “copied” off one another. Does this in any way take away from the gospels’ credibility? Q: If God wanted to us to fully understand and receive the word why didn’t Jesus just write a gospel or the gospels? A: “We should expect some differences between four independent accounts. If they were identical, we would suspect the writers of collaboration with one another. Because of their differences, the four Gospels actually give us a fuller and richer picture of Jesus. Q: In the beginning of Matthew why does it jump from Jesus being around 2 years old to being an adult? Why are there no records of in between those ages? Q: What is the benefit of having four gospels rather than only have one or two? A: The four gospels are not identical. In fact, they are focused on bringing light to Jesus with inherently different nature, content, and facts. Matthew wrote to a Jewish audience, and he wanted them to understand that Jesus came to fulfill the Old Testament prophecies. Mark wrote to a Gentile audience about the divinity of Christ, and he did not include facts that would have been disregarded by the original audience. He wove the life of Jesus to be the true indication that he was different from people; Jesus was portrayed to be divine. Luke wrote the gospel to pertain facts about the life that Jesus led. John wrote a gospel that had a very theological basis because it was based around his own encounter with Jesus. The gospels gave people of different backgrounds and preferences the opportunity to accept Christ as their Lord and Savior. There was no elitist group that would only hear the good news. Additionally, the gospels provide a richer and fuller picture of who Jesus was because they are not identical. The authors all had different perspectives on the character of Jesus, but he did not display any contradicting nature in any of them. The gospels can be trustworthy because they were not created by a group of people collaborating together. They were taken down by devout followers of Christ who were dedicated to providing a true picture of Jesus. Q: The book stated that there are many instances in which Jesus is quoted without the original context given. Would having the context for many of Jesus’ sayings actually benefit us in understanding the intended message? Question: Page 136 of “How To Read the Bible…” shows that the Gospels were not written completely independent of each other. All four Gospels have the same main stories about the life of Christ. If the authors collaborated to some extent, why wouldn’t they each decide to write about different events so we could know even more about Christ? Answer: Matthew, Mark, Luke and John include the same centarl events but were written to different audiences. They present Christ’s ministry and life from different viewpoints. Matthew was a tax collector. His Gospel would be easy for Roman citizens to understand and accept. Mark came from a wealthy family, very plugged into culture. He was able to write in a way memebrs of Greek society could relate to. Luke often uses the word “we” in his Gospel. This shows that he writes from the point of view of an eye witness. John is different from the other three books in that it focuses more on an individual relationship with Jesus, rather than his interaction with the public. We need all four Gospels, because even though they tell the same stories each one appeals to a different audience in they way they can best understand it. The author’s style of writing is not important. Ultimate importance is that the message of the Gospel is reaching people. Question for Mr. Webster: Some books of the NT are meant to be read in one sitting. Is it better to study each Gospel as a whole or by individual chapter? What makes one way better than the other? Also, what is the value to reading parts of the Gospel even if they don’t relate to our personal experiences? Question: Why is context so important to what Jesus said? Answer: It is important because we have to understand the world into which Jesus came. For example, in Matthew when he speaks on divorce, Jesus stepped into a culture that had pharisees that believed that divorce was a husbands right. Some even believed that if there was something wrong enough with the wife the husband could put her away. Others believed that if the wife even did something distasteful they could divorce her. Herod and his sons were also part of this picture. The line of Herod cared for lust and did not care for the laws regarding marriage. Also, the Essenes believed that remarriage was something they could not do. Into all this Jesus walked in and spoke of divorce. Jesus spoke into a culture that was lost in how to handle divorce. If we did not know this whole context we could not understand just how important Jesus speaking on divorce was. Question: How important do you believe it is that Jesus was eloquent in parables and hyperbole? Question: Jesus preached in Aramaic and the gospels were written in Greek, were his sermons memorized and passed on accurately? Answer: The evidence shows that in oral cultures where memory has been trained for generations, oral memory can accurately preserve and pass on large amounts of information. The Jews placed a high value on memorizing whatever writing reflected inspired Scripture and the wisdom of God. This was a part of their culture similar to how memorizing lyrics to a song is a part of ours. We can have confidence then that the oral tradition accurately preserved the teachings and the events of Jesus’ life till they were written down just a few years later. Question: Why are there only 4 gospels? Certainly Jesus had done more between being a child and his adulthood, so why aren’t there more gospels to talk about that him during the time gap? How do we know if the four gospels are reliable? All of the gospels are different from each other, from their content and the facts they include or exclude. They are different because of the writers. The writers were writing to specific audiences, which is different in each one. It is expected that there would be differences since they were written by different people. Just because they have differences, it does not mean there are errors. If they were similar it would seem like the writers were collaborating. Since they are all different it gives us a fuller view of Jesus’s life. If the gospels are a lot of facts about Jesus, why wouldn’t they be called biographies? Q: Since Jesus was perfect, why did God leave the writing of the Gospels up to flawed people? A: God’s plan for His Son was not to have him write about his own life. It would have looked sketchy if Jesus would have written the Gospels himself. People would have accuses him of making up the whole things to make his “fulfilled prophecies” seem real. It takes trustworthy eye witnesses to make Jesus’ life believable. Q: Why would John not tell us all of Jesus miracles? Question: The four gospels have many similarities but were all written by different authors. How is this possible if they didn’t really work together as they wrote the four gospels? Question for Webby: This chapter talks about the gospels and how it is necessary to think horizontally and vertically, it goes into detail about horizontal thinking but doesn’t seem to go into as much detail about vertical thinking. Why is it so important to have these two different mindsets while reading and interpreting the gospels? Question: How do the differences in the four Gospels give us a fuller and richer picture of Jesus, while being confident there are no errors? Answer: As readers, we need to look at the gospels from the view of each writer. The content of the gospels vary, because every writer had a unique perspective and different audience.“Imagine if four people wrote a biography on your life: your son, your father, a co-worker, and a good friend. They would each focus on different aspects of your life and write from a unique perspective. One would be writing about you as a parent, another as a child growing up, one as a professional, and one as a peer. Each may include different stories or see the same event from a different angle, but their differences would not mean they are in error. When we put all four accounts together, we would get a richer picture of your life and character. That is what is taking place in the Gospels.” Each writer had a different audience to address, and an altering viewpoint from another writer. Everybody interpreted Jesus’ working in a different way. Differences do not mean errors. They differences give us a better insight on Jesus and the story He is telling. Question: Were the Gospels written by eyewitnesses as they claim, or were they written centuries later? 1. Question – Why did Jesus use so many stories and parables in the gospels when teaching those listening to Him? Answer – Telling stories was one of Jesus’ most characteristic modes of teaching. They were ways of breaking open the worldview of Jesus’ hearers, so that it could be remolded into the worldview that he, Jesus, was commending. His stories, like all stories in principle, invited his hearers into a new world making the Implicit suggestion that the new worldview be tried on for size with a view to permanent purchase. 2. Question – Why do we need four Gospels as opposed to just having one? Q. Why are the 4 gospels so different? Answer: Mathew, Mark, Luke, and John all wrote about Jesus and his life, however they wrote from different contexts, and viewpoints but at the same time they were writing to different audiences for different purposes. Mathew wrote to a Jewish audience and his point was to prove Jesus was the messiah, he included many of Jesus’ teachings. Mark wrote to a greek and gentile audience so he told stories of Christ’s life to prove he is the son of god. Luke wrote to give an accurate historical account of Jesus life. And John wrote his own account reflecting on his time with Jesus for many years. Q for webster: Since Jesus did not ever write any books of the bible do you think it would increase the NT reliability or impact if we could have his own account of all the events that took place to cross reference with the other gospels. All four Gospel books contain relatively the same historical information. If they were all so similar, why could they have not just been combined as one and be written by a singular author? On page 133, the author brings up the idea of Jesus keeping his messiahship hidden. Why would a loving God hold back information about himself that could affect the ultimate faith of thousands of people? What is a better definition for thinking vertically and horizontally? Vertically, we have a relationship with God and horizontally we have relationships with each other. Vertically the primary focus is Sin, Salvation, Sanctification, Sovereignty. Horizontally the primary focus should be about service: How we live out our theology, our beliefs about God with one another. Question 2: Who exactly gave the authors Matthew, Mark, and Luke the story of the birth of Jesus since they weren’t eye witnesses? Question: Was the oral tradition memorized and passed on accurately? Answer: The evidence shows that in oral cultures where memory has been trained for generations, oral memory can accurately preserve and pass on large amounts of information. Deuteronomy 6:4-9 reveals to us how important oral instruction and memory of divine teaching was stressed in Jewish culture. It is a well-known fact that the rabbis had the O.T. and much of the oral law committed to memory. The Jews placed a high value on memorizing whatever wri ting reflected inspired Scripture and the wisdom of God. Question: Do miracles discredit the gospels? Q — Why did Jesus teach in parables? A — Jesus taught in parables for several reasons. First of all, parables, which are similar to fables, are easy to remember. Adults can remember fables that they were told all the way back when they were kids, and parables are meant to have the same effect. Secondly, Jesus spoke in parables so that only those who really cared about knowing the truth would be able to understand. For example, with many of Jesus’ parables, those listening did not grasp the meaning the first time they heard it. Jesus had to explain it to them. Only those who cared enough to stay longer were able to learn. Q — Were the authors of the four gospels each aware that there was someone else writing about the life and teachings of Jesus? If so, why not just work together and create one gospel? Question: What is the reasons for having four Gospel’s? Why couldn’t there have just been one big one? Answer: These Gospel’s are each different in nature, content, and the facts they include or exclude. The reason for the variations is that each author wrote to a different audience and from his own unique perspective. Matthew wrote to a Jewish audience to prove to them that Jesus is indeed their Messiah. Mark wrote to a Greek or Gentile audience to prove that Jesus is the Son of God. Luke wrote to give an accurate historical account of Jesus’ life. John wrote after reflecting on his encounter with Christ for many years. God wants to reveal himself through different perspectives to different readers to help them understand more of his character. Question for Webster: Why are the Gospels written in Greek if Jesus’s native tongue is in Aramaic? Q — The book said that the differences in the Gospels are partially due to the fact that they were each directed at a different audience. What were the intended audiences and purposes of each of the four Gospels? A — Matthew was aimed at those who were familiar with the Old Testament, particularly the Jews. This is shown in how Matthew focuses on showing that Jesus was the fulfillment of the Old Testament prophecies and that He was the promised Messiah. Mark was written for readers that were unfamiliar with the Old Testament. Mark is a “Gospel of action,” portraying Jesus “as the servant of the Lord doing that job that God has sent Him to do.” Luke aimed his Gospel at the more intellectually minded people who had been influenced by Greek culture. The Greeks looked for the perfect man in their art and literature. Mark portrays Jesus as the perfect man, focusing on the events in His life that stress His humanity. John wrote his eyewitness account of Jesus in order that anyone who read it “may believe that Jesus is the Christ, the Son of God, and that believing you may have life in his name” (John 20:31). Q — Why is there no record of Jesus in between his childhood and adulthood? Do you think that he performed miracles before he officially began his ministry that are not recorded in the Bible? Q: Why do we need to learn how understand the gospel as the two-level document it is? A: Nonetheless, the nature of the Gospels is a given; they are two-level documents, whether one likes it or not. We do not begin to think that we can make you an expert in these matters. Our hope here is simply to raise your awareness level so that you will have a greater appreciation for what the Gospels are, as well as a good grasp of the kinds of questions you need to ask as you read them. Q for Mr. Webster: How did the certain kinds of scholarship manage to distort the gospel in order to ruin its trustworthiness? Q1: The stories are not the same within the four Gospels, and were chosen based upon what the author thought was most important. Does this mean that the authors were the ultimate authority for what the Gospels should include? A: First of all the Bible claims to be inspired by God. It was written by human authors, who were used by God to deliver his word. Second of all not all humans are alike. All throughout the Bible we see God speaking into the lives of individuals. They all have their unique testimony to how God has worked in their life. The difference in their personal stories doesn’t discredit God’s truth. That is why we can be more certain that the four Gospels find their ultimate authority in God. All four authors had their own personal testimony to how Jesus changed their life. And out of their inspiration they wrote their own unique perspective on Jesus’ life. The truth of Jesus’ message is still the same and isn’t determined by the author. Q2: Assuming that the words of Jesus weren’t written down right as he said it, and were written down by his disciples many years later, how can we be more certain that when the Gospels quote Jesus they are correct and not are not error by human memory? Question: Why did Matthew write his gospel if Mark’s gospel was already existent? Answer: Matthew wrote his gospel after Mark’s gospel. Matthew wanted to add important information to Jesus’ story that he thought Mark had left out. Mark’s gospel was a catalyst for Matthew’s gospel. It was an initial source that Matthew used to then expand upon. Another reason why Matthew wrote his gospel was because his Jewish-Christian congregation was being persecuted by their Jewish neighbors. Q1: There are four different gospels written by four different authors, all including and excluding certain details when recounting Jesus’ life. Why does the Bible include four versions of the same story and doesn’t this mean that the authors and not God had the final say in what was retold of Jesus’ life? A: All scripture is God-breathed. With that being said, each of the four gospels, like every other book in the Bible, were written through a certain individuals’ perspective. God showed each gospel writer what he wanted retold, and the authors took liberties in deciding what to include or not based on what they thought would be helpful. All four authors were addressing different audiences in their writings and so they left out certain minor details while emphasizing others to help personalize the message to their respective audiences. Even so, while Matthew, Mark, Luke, and John may have minor discrepancies throughout their books, none of the core values of Christianity are tested and therefore, there is no problem with including four gospels. Q2: Aside from being inspired by God, was there any actual person who informed Matthew, Mark, and Luke about the events that transpired at Jesus’ birth since none of them were born yet? Did they have elders that told them the story which they in turn wrote down, or was it solely because of God that they knew? Question: If Jesus’s native tongue was Aramaic, why were his teaching originally given to us in Greek? Question for Webster: Why was part of the New Testament not written by Jesus himself? Question: Are there major inconsistencies between any of the gospels that should concern us? Answer: A contradiction is defined as this- Two sentences together are contradictory in this way: If one sentence is true, then other has to be false. There are examples of factual contradictions in the gospels, but they can be explained. One example of a factual contradiction is when in Matt. 28:8 The women reported the resurrection to the men. In Mark 16:8 it says the women did not report the resurrection to the men. This can be explained because Mark was not finished like the other gospels are. There are also theological contradictions, but these can also be explained. An example of this is in Matt. 8:26 when Jesus says “O you of little faith!” and in Mark 4:40 He says “Do you still have no faith?.” People consider this a contradiction because it can lead to different meanings. However, these theological perspectives are not identical, but they are complementary. Matthew chose to highlight the positive side as a model for the fainthearted, while Mark chose to highlight the negative side for the same reason. They both wanted to encourage those who felt inadequate that they could grow in their Christian lives. In conclusion, there are contradictions in the gospels but they are minor and have adequate explanations. Question for Web: How did Jesus’ miracles demonstrate the kingdom of God breaking through? Question: Why didn’t Jesus himself ever write anything? Answer: It has been demonstrated that Jesus did have the ability to read and write, but the fact that he didn’t write his own gospel for us still remains a mystery. We do not know why he didn’t write anything down, but it can be assumed that it is used to strengthen his authenticity. The book itself says that, “the fact that the gospels were not written by Jesus … is a part of their genius.” If Jesus were the only person to have written a gospel, that gospel would not be very credible. The fact that multiple men wrote their own account of what had happened strengthens the case for Christ. Question for Webster: Why did so many accounts of the gospel need to be written, why not just one? Question: Since the Text of the Gospels are perfect why would God allow some typos and discrepancies in the text? Answer: God was not writing the New Testament by hand but rather inspiring the authors to write what they did. By human nature we make mistakes as did the authors, they are not perfect. God seemed to do this for a reason to show that he is not controlling everything we do in our lives. He shows that we do have a choice to choose whether we sin, we obey him, or we surrender our lives to him. We might mistakes but as we can see God will find a way to make everything right. Question for Webster: How can we apply the Gospels in our lives today?